Abstract: The purpose of this paper is to discuss the impact of technology on translation from the point of view of a freelance translator and translator trainer. In particular, it will examine the role of the Internet on the way we train translators as well as the way translators find work and produce translations. The paper will look at the role of the Internet as a source of work and show that in addition to changing how we translate, it has also changed what we translate. These changes in turn necessitate a significant reassessment of the way educators prepare translators for professional life. The paper will also discuss the challenges and opportunities the Internet presents for the training of translators. Throughout history, technology and translation have always been inextricably linked in one form or another. For the most part, translation has facilitated the dissemination of technology by making new scientific and technological expertise available to new audiences. However, technology has also played a significant role in the promotion of translation. In the 15th century when Gutenberg developed moveable type printing, few could have predicted the explosion in translation activity that would ensue. Since then, the relationship between the two has continued although the role of technology has remained somewhat static in the centuries since Gutenberg. Despite developments such as electric typewriters, telex machines, fax machines and even the personal computer, translation has remained relatively untouched by technology. However, over the past 10 years, something remarkable has happened. The Internet has emerged from its humble origins as a government-funded research project to become even more revolutionary than printing itself. It has transformed not only the way we produce translations, but also the way the translation industry functions and also the way we train translators. While there is speculation as to the true origins of moveable type printing with claims that a rudimentary and difficult to use system was developed in China between 1041-1048, Johannes Gutenberg is widely credited as the inventor of moveable type printing. Developed in 1447, the introduction of the new technology and coupled with Gutenberg’s efficient production methods resulted in the widespread success of moveable type printing and set in motion one of the most fundamental transformations of translation. Whereas previous printing methods involved carving entire pages of text into blocks of wood, a time-consuming and costly process which was prone to errors and wastage, moveable type printing was cheaper, faster and more effective. It permitted the mass production of books such as the Bible and had a tremendous impact on the production and translation of numerous other works. The most immediate result of this development was the explosion in the number of books written throughout Europe. In England alone, numerous books appeared dealing with areas such as medicine, farming and animal husbandry, gardening, household management and cooking, horse riding, falconry, fencing, archery, swimming, military science and navigation, road building, carpentry, stained glass making etc. (Tebeaux 1997:14-30) and, thanks to the ease and cost effectiveness of Gutenberg’s printing process, they achieved levels of distribution previously unheard of. Montgomery (2000:2) tells us that “knowledge has always been a mobile form of culture” but asks the question as to how knowledge is rendered mobile. What is it, he asks, that makes knowledge capable of crossing the boundaries of time, place and language? There can be no doubt that printing, simply by providing easier access to a relatively plentiful supply of texts, played a crucial role but Montgomery here is alluding to translation. Indeed, the same availability of books as opposed to manuscripts which were jealously guarded away in university and monastery libraries meant that translators had access to unprecedented volumes of “raw materials” with which to meet the demand for scientific, religious and cultural knowledge from other countries. But printing also signified the start of a new era in translation itself. Prior to printing, there existed a manuscript culture where variability and uncertainty pervaded the translation process. At the time, translation lacked formal standards with regard to accuracy and quality so much so that mistranslations or even omissions of difficult passages were common (Montgomery 2000:178). Such was the difficulty in relying on manuscripts for translation purposes that it was common for copies of the same work in Paris and Oxford to have quite significant differences in terms of content (Grant 1992:367). Grant (ibid.) also remarks that “…knowledge was as likely to disappear as to be acquired during the translation process”. Printing, however, changed this because texts became “fixed”; objects to be respected rather than pieces of vellum to be written and copied by anyone. We could argue that printing raised standards within translation and ultimately gave rise to various translation theories and concepts including equivalence, faithfulness, loyalty etc. Conceived in the 1950s during the Cold War as a military research project to develop a means of ensuring government and military communications in the event of a nuclear war, the Internet is a rather unlikely candidate for the role of most significant influence on translation. Initially consisting of just a few computers at research institutes funded by DARPA (the US Department of Defense’s Defense Advanced Research Projects Agency), the Internet project expanded and eventually included university computers and networks. For the first 20 or so years of its existence the Internet largely remained the preserve of universities, with the general public not even aware of its existence. By the 1990s, however, when the world-wide web as we know it emerged, the Internet had gained greater visibility and popularity among the general population due to increasing technological advances and increasingly easier access thanks to the growing number of ISPs (Internet Service Providers). It is estimated that at present there are some 1 billion Internet users world-wide with the majority residing outside of the US, the Internet’s spiritual home. The following table shows that the most significant levels of growth in Internet use have taken place in Africa (625.8%) and the Middle East (479.3%) compared to North America where growth was just 112%. Just as few could have predicted the impact printing would have, not just on science, technology, politics, religion, trade etc. but also on translation, even fewer people could have predicted the extent of the changes which would come about as a result of the Internet. Despite the fact that the Internet has existed in one form or another for well over 50 years, it was virtually unheard of 20-30 years ago. It is only in the last 10-15 years that the Internet has truly made its mark. This is particularly true with regard to translation. In 1971 Sykes referred to typewriters as a staple part of any translator’s office. It is worth remembering that unlike modern, compact and powerful PCs, computers at that time were bulky, room-sized contraptions the cost and complexity of which put them firmly beyond the reach of ordinary translators. Some 25 years later, O’Hagan’s (1996:5) reference to the fax as the most popular means of text communication shows that the Internet had yet to establish itself as a core component of the translation landscape. Despite Byrne’s (1999) recognition of the profound changes and challenges facing modern translators and discussion the new types of work presented by the Internet, it was still impossible to foresee the full extent of the tremendous developments to come about as a result of the Internet. In the last decade, the Internet has changed business models throughout the world, in all industries and business sectors and has gone hand in glove with globalisation. In the translation industry it has created new demands for translations and placed new demands on translators, requiring them to adopt new technologies and practices as part of their day-to-day work. Indeed, technology has almost created its own demand. By facilitating global business, it creates a demand for new processes which inevitably involve the use of technology. This increased “technologisation” or digitisation (Austermühl 2001:5) of translation raises the expectation and demand for more technology, faster turnaround and better services. To meet these demands, more technology is needed and the cycle continues. In the context of the translation industry, the Internet has affected the role of translators and the arena in which they work in a number of ways. By facilitating communication and effectively eliminating the boundaries between local and international markets, the Internet has helped to create a global translation market estimated to be worth in the region of US$13 billion (Allied Business Intelligence 2001). The situation now is that there is more work available for translators as a result of increased global trade and improved access to foreign translation markets and clients which in turn brings with it new types of work. Instead of being restricted to the subjects and texts produced by indigenous industries and clients, we can get virtually any type of text on virtually any subject from anywhere in the world. For example, a translator may receive software localisation projects from Ireland, railway engineering specifications from Spain and Singapore, television advertisements from the US, combine harvester manuals from Germany, exercise guides from Austria and so on. But this apparent abundance of work courtesy of the Internet brings with it new challenges for translators in the form of greater competition from other translators. So while there may be “gold in them there hills”, translators will need to fetch their shovels and start digging. The Internet has been instrumental in translation making the transition from a largely paper-based activity to an almost exclusively computer-based one. Reading through books such as Austermühl (2001), Bowker (2002) or Esselink (2000) it quickly becomes apparent just how much technology is involved in modern translation: PCs, email, FTP, website design, search engines, spreadsheets, online databases, DTP, graphics, word processing etc. These are just the non-translation specific tools. If we include the likes of translation memory (TM) tools, terminology management systems, concordancing tools, machine translation, project management applications, localisation and quality assurance tools the list gets much longer and much more complicated. Particularly in the case of TM tools, we could argue that such technology owes its very existence to the Internet. If we consider the fact that a fundamental prerequisite for using TM tools is the availability of texts in electronic form it is clear that without email or the ability to download files from websites or FTP servers (File Transfer Protocol), our options for using translation memory tools would be severely limited. Our options for obtaining electronic texts would be for the client to post a CD containing the files to us; to type up the document from a paper version or to use optical character recognition (OCR) to scan the documents into our computer. None of these options is particularly practical or efficient. Indeed, such is the complexity of OCR (see Bowker 2000:22-42) that the amount of time required to scan a translation and transform it into electronic format would be likely to outweigh any benefits of using the TM tool. Without the ubiquity of electronic texts as facilitated by the Internet, it is hard to imagine translation memory tools achieving almost universal acceptance and use. The increased use of TM tools has in turn impacted significantly on the way in which translators are paid for their work. The increased awareness among clients and translation agencies of TM tools and their capabilities means that more and more clients expect translators to pass on the benefits in the form of discounts. As a result, graded payment structures such as the one shown below are not uncommon. While translation memory tools have alleviated much of the mundane, monotonous work involved in the translation of certain types of texts, it has also resulted in a drop in the translator’s income, despite the fact that the translator have to spend money to buy the technology in the first place. While owning a TM tool may open up new markets for a translator it is, at least in the beginning, an investment that ultimately costs money rather than generates it. For translators, the challenges presented by the Internet mean that they need to invest in new technologies, primarily software, as well as the infrastructure necessary to support them. This might include more powerful computers with faster processors, more storage etc as well as securing the fastest Internet access available. However, with this barrage of new technologies that translators are told they simply must have, many translators will find themselves in the position of having spent vast amounts of money on technologies which they cannot use to their full potential. As such, there is a distinct need for translators to commit to a process of on-going training in order to stay abreast of these technologies. This requires both time and money on the part of translators, something which is challenging in that when translators are not translating, they are not earning money. But just as there are myriad new tools for translators to come to terms with, the increasing competition presented as a result of the increased access to clients coupled with the sheer diversity of work available means that the issue of versatility is equally, if not more challenging for translators. The very ease with which translators can access translation work has created intense competition within certain sectors of the translation market. As a result, it is increasingly difficult, if not impossible, for a translator to comfortably earn a living from one single specialism. As part of the commitment to on-going training and lifelong learning, translators find themselves in a position where they have to acquire new specialisms in order to remain competitive and employable. This requires a versatility from translators which can see them performing roles which they may never have considered, such as localiser, editor, cultural consultant or tester, or working in ways which they may not have wanted, for example as a freelancer, as part of a distributed team of freelance translators or as an on-call translator. Indeed, coming to terms with working as a vendor frequently regarded as a “resource” particularly in localisation circles is quite a culture shock for those more used to dealing directly with traditional clients. However, such is the scarcity of in-house translation jobs, the vast majority of translators in the world are working in some form of freelance capacity. Unlike the 1970s when freelancers were very much in the minority (Finlay 1971:30), most translation work today is done by freelancers. EUATEC, the European Union of Associations of Translation Companies, estimates that freelancers account for some 80% of the global translation market (Boucau 2005:28). In order to ensure a steady and reliable stream of work, creative marketing and a more active approach to finding work are essential to help translators stand out from the dozens or hundreds of other translators with the same language pairs competing for the same projects. This is particularly true for full-time freelancers who are more vulnerable to quiet periods when work is scarce. While translators need to be aware of the various different ways of finding work e.g. bidding for jobs on translator forums, advertising, websites etc., it is vital, in order to make the best use of these resources, that translators are aware of their own skills and what it is they can offer prospective clients. By conducting some form of reflective assessment or skills audit, translators will be able to identify what makes them unique or different. The Internet has had a two-fold impact on the job of trainers and it gives us cause to reassess not only what we teach but also how we teach it. While it is certainly true that students on translation programmes expect and indeed are entitled to be suitably prepared for the demands of the workplace, the challenges of keeping up with industry and the numerous technological aids, facilitated in no small part by the Internet mean that we need to ask several questions of the training we provide. The first such question is whether we can teach students how to use every tool and technology they are likely to need in their professional lives and indeed should we. With so many tools available it would be difficult to find time in already hectic training curricula to teach these subjects and we would run the risk of spending too much time teaching technologies and not enough time on the actual process of translating (Byrne 2003:168). Furthermore, with software which is constantly being revised, updated and improved we should, perhaps, ask ourselves whether it would be more useful to provide students with generic and transferable skills in the use of the various technologies which would allow them to adapt to any changes or improvements in technologies. 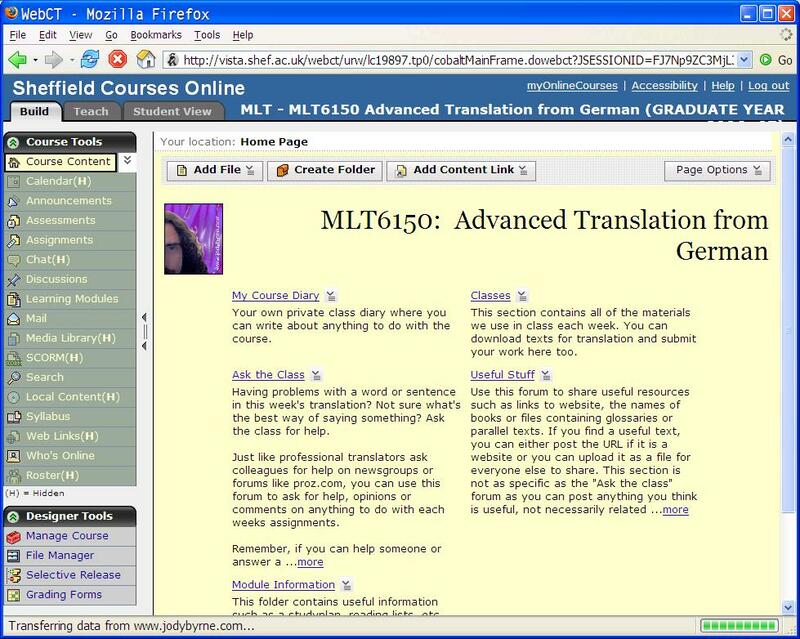 It could be argued that general computer literacy coupled with a reasonable amount of training in specific translation tools would serve students just as well and is a much more realistic proposition. But the implications of the Internet and its associated technologies do not simply impact on what we teach. Like virtually every other sphere of modern human activity, teaching too has seen important changes in recent times as a result of technology. Perhaps the most promising and exciting newcomer to the educational arena is that of online learning, or more specifically, Virtual Learning Environments (VLE) such as Moodle or WebCT. A VLE is essentially a website which allows teachers and students to communicate and share resources in a collaborative, electronic environment. Figure 1 shows what a typical WebCT course looks like. VLEs can be used simply as a repository for course notes which can be accessed from anywhere and at anytime or they can be used for collaborative work such as discussions, online workshops, quizzes, polls, surveys etc. where the technology facilitates the provision of a richer range of resources. One of the more interesting features of VLEs is the democratising effect they can have within a class. Whereas certain students may lack the confidence to participate fully in a classroom, contributing to discussions online via message boards provides a safe and undaunting alternative for students. From my own experience, I have seen the confidence gained from online work make its way into the classroom situation with previously shy students playing a more active role in class discussions. A range of other activities are facilitated by online learning environments and while not necessarily new or revolutionary, are made more effective through the use of technology. Of particular interest from the above list is the use of online tutorials which frequently use videos or animations to illustrate instrumental competences using software or websites. Instead of demonstrating a procedure in front of a class full of students, it is possible to record a procedure as it is carried out on screen and save it as a video file which can either be streamed or downloaded from a website by students and watched as many times as necessary until they feel comfortable that they understand the procedure. Figure 2 illustrates how actions performed on screen can be recorded in an online tutorial. The obvious benefit of this strategy is that it frees up class time while allowing students to proceed at their own pace. In effect it emulates 1-to-1 teaching to a certain extent. As exciting and full of potential as these technologies are, using them with the intention of radically transforming the way we teach translation is fraught with potential problems. Just as the decision as to what we should teach students needs to be based on an assessment of what is reasonable, feasible and indeed appropriate, selecting appropriate teaching technologies also requires a well considered and pragmatic approach. While it is tempting to use a whole host of technological “enhancements” across the board without any serious planning or consideration of objectives and outcomes, the mere availability of such tools does not mean that they can or should be used. When beginning to use e-learning technologies it is all too easy to become overwhelmed or even overawed by the apparently limitless possibilities on offer and to allow the technology to dictate the form and structure of courses. This is not necessarily a problem in all cases but it does defeat somewhat the purpose of technology which is first and foremost a tool which makes it easier to do something else. It is, therefore, essential that we relate the new technologies to the needs of translator education and the goals and objectives we hope to achieve. Conversely, there is a tendency to use the technologies in the most basic way possible purely for the sake of saying that e-learning is a feature of one’s teaching or because the ways in which the technologies can be harnessed are not clear. Apart from the fact that such approaches do not make full use of the capabilities of the technology, they do little to improve teaching provision or students’ learning experiences. As Kelly (2005:85) points out, simply putting lecture notes online is not enhancing learning, primarily because it is not very different to giving handouts in class. In any case, there is an absolute need for some form of reflection and self-evaluation by trainers as well as an assessment of teaching goals and methods. In the preceding sections we have seen how translation both as a profession and as a subject to be taught has undergone substantial changes as a result of two major scientific inventions, i.e. printing and the Internet. While it is easy to appreciate the impact printing has had, the role of the Internet is not always so clear. Indeed, the Internet, it can be argued, has had a much more profound impact on translation in terms of the way it is carried out and the tools that are used as well as the industry that has developed around it. Without the Internet we could argue that working as a translator would be more difficult in terms of finding work and producing translations. The Internet can also be credited with the proliferation of translation technologies such as translation memories and localisation tools. Unlike printing, however, the Internet has also changed the way in which translation is taught. It is almost unheard of for a translation programme not to include some form of tuition in translation technology, something which is, without doubt attributable at least in part to the Internet. In addition, the Internet has given rise to technologies which have changed not just what we teach, but how we teach. As well as the issue of how to teach translation using traditional methods, we are now forced to consider the role of new teaching methods facilitated by web-based technologies. One thing is certain, however, that with the majority of the most significant changes to affect translation occurring in the last 15 or so years, the coming decades are certain to be exciting and extremely dynamic.